I have read several questions on here regarding this topic but my situation is slightly unique. I have a TV mount that is about 20" wide. The studs in my wall are 24" apart. I am mounting a 55" tv. The tv weighs 53 lbs and the mount is at most 20 lbs. The mount does swivel so it might be pulled on to swivel the tv. The way I see it I have 2 options. First, put a piece of 3/4" ply wood into the studs and mount the tv on the ply wood. Or the second is a little easier, I can mount the TV into 1 stud and use heavy duty anchors on the other side of the mount. The anchors I have say they will hold up to 110 lbs. So 2 screws into the anchors and 2 screws into the stud. It seems like this will work, but I don't want to take chances with the TV. EDIT*** It is a steel stud. So I bought drywall toggles rated to 110 lbs. I am going to propose the following and ask what people think. There are 8 holes in the mount. What if I use the drywall toggles to mount the TV in the 2 holes nearest the center of the mount, then use Drywall anchors with a high weight rating in the other 6 holes. Between 8 anchors/toggles totaling almost 900 lbs with 2 of them mounted into a steel beam seems to me that it would be sufficient. I'd also comment that I have no intention of using the swivel feature. Do not use drywall anchors to hang a TV that large on a swivel mount. If it was a mount that didn't have motion, I might say that's acceptable, but not with a swivel mount. You will need to use wood in some form to add the necessary strength. Plywood can be attached to the wall studs using 3-1/2" lag bolts with fender washers. To provide a clean finish, the drywall can be cutout and the opening filled with the plywood. Then tape and mud the joints. Sand the surface smooth, prime, and paint. The plywood will be barely noticeable if done right. Be sure to match the plywood thickness to the drywall thickness. If you do not want to remove any drywall, the plywood can be mounted directly over the drywall. You will need to use at least a 4" lag bolt in this case to account for the extra depth of the drywall. The plywood can be finished with a routed edge, sanded, primed, and painted for a finished look, if desired. A final option for a truly hidden mount would be to open the wall by removing the drywall. Then install 2"x4" crossbracing between the studs at the correct locations for your TV mount. Replace the drywall, tape and mud the joints, sand, prime, and paint. The bracing is now hidden in the wall and you can attach the mount to the bracing. Plywood would work well, but may not provide the nicest of aesthetics. A 1x3 board (or thicker/wider) at least 25 inches long would provide more than adequate load capacity and convenience of attachment points. Depending on the bracket mount, perhaps two such boards would be needed to attach upper and lower points and keep the bracket parallel to the wall. EDIT*** It is a steel stud. This is actually very bad news. Steel drywall studs are sheet metal, not structural iron. They are designed to hold up drywall, using the very sharp-tipped drywall screws, and not much else. They typically don't have enough strength to take a large drill bit without buckling, and you will get the standard thin-metal messy hole as a result. Between 8 anchors/toggles totally almost 900 lbs with 2 of them mounted into a steel beam seems to me that it would be sufficient. The ratings are best-case, new installation. Overtorque a toggle anchor and it starts to cut through the back of the drywall. Leaves a nice big hole when it pulls out. As others have stated, a plywood panel is the best choice. Pre-drill the panel for the drywall screws, use steel-stud screws 1 inch longer than plywood + drywall, don't overtighten. If you don't pre-drill the plywood it will not tighten up properly. If you are inserting wood backing into a finished wall please be aware you may be able to do so from the opposite side of the wall. Especially if doing so will be easier for the installer, make less mess, and be less conspicuous. If you are hanging an articulating arm for use with a 55" TV, toggles, hollow wall anchors, moly bolts, ZipIts®, SpinIns®, or any other novel fastener **will carry the weight but cannot provide for a static installation due to the underlying angular forces going into or out the plane. In other words, "You'll eventually pull it off the wall, with or without the attached drywall." How about a better mounting bracket? I know they make ceiling fan mounting kits for remodel jobs so why not for flat screen? Check out what's available for TVs before you demo the wall if it should come to that. I know there's a lot of hardware out there, although finding it can be difficult. Check out commercial grade hardware as well as out of state or out of country vendors. Be sure to read the manufacturers instructions as their concern for liability is at least as great as yours. They also have professional engineers on staff or under contract to help write the directions for you, the companies legal department, and everybody else, so don't poo poo the directions(like I do sometimes) right off the bat. Sorry I don't have an easy fix. Whenever mounting anything that moves, I always emphasize overkill on "my" installations. Movement over long periods of time is almost impossible to see early on and by the time its noticeable it's usually too late for a quick and easy fix. Good luck! It never hurts to think outside the box. Just don't forget to always consider the environment you're working in as it pertains to client side safety! I used two boards, 52 inches in length, used 3 1/2 inch wood bolts, put six bolts with washer in studs and top board was put on wall with bracket at same time. I drilled hole in board first and aligned bracket to hole and stud. I hung a 75 inch tv, worked perfectly. we needed three people, with mantle over fireplace. Not the answer you're looking for? Browse other questions tagged drywall mounting or ask your own question. 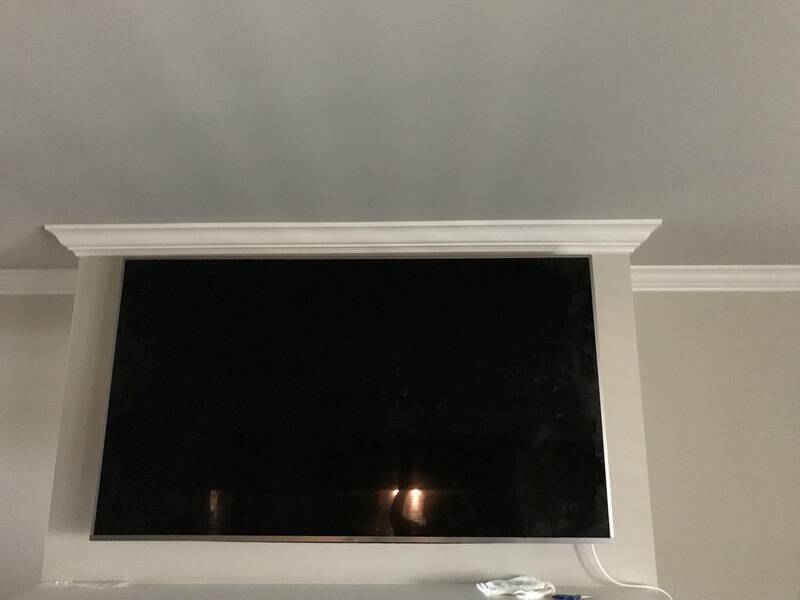 How do I mount TV through 3 layers of drywall and into studs? Can I hang a bathroom cabinet on a single stud and drywall anchors? Can you “extend” a drywall stud? How to hang a TV on a drywall with no studs and no room for toggle bolts? Can I mount a TV on a single metal stud?